\r\n\r\nIn this tutorial, I’m using Rihanna as an example. After you’ve searched for your artist and clicked the “Search” button, you will be taken to the results. The results you get from MusicBrainz are listed in the most relevant order, according to your search text. In this example I search for Rihanna, and the results will then look like this;\r\n\r\n \r\nAs you can see the artist “Rihanna” has 100 in score, and is the most relevant result MusicBrainz can find. The higher score there is, the most relevant is the result. Click on the result that is the artist you are looking for. (In some cases, the artist you are looking for isn’t the most relevant result by MusicBrainz)\r\n\r\n3) After clicking on the correct result after your search, you will be taken to the artist/band page. Normally it will display some generic information, and we really don’t need this for adding an album to the database. You should be looking for the header “Discography” and under that a subheader named “Albums” like this;\r\n\r\n \r\nClick on the album title you wish to add to the fanart.tv database. I’m clicking on “Unapologetic” in this tutorial.\r\n\r\n4) You will now see the page for the album you clicked on. At the top, you will see something like this;\r\n\r\n \r\n\r\nAs you can see, you have some tabs to choose from. Click on the tab named “Details”, as this tab contains the information you are looking for. In the “Details” tab you will most probably have five different lines, but the one we are looking for is named “MBID”.\r\n\r\n Copy the numbers you see next to “MBID”. 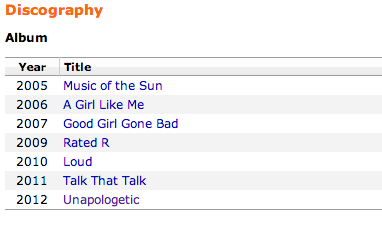 In this example the MBID for Rihannas “Unapologetic” is “1ab3ba95-bc96-46f4-bc6d-1e57bc6ad1a0”. ALWAYS make sure to copy the release group id, and not the id for the actual album itself. This is important.\r\n\r\n5) After you’ve copied the MBID to the correct album, head back to the artist page on fanart.tv you already have open in another tab/window in your browser. On the top of the artist page, directly under the large image, you will find a form where you can add albums and paste in your MBID. The form looks like this;\r\n\r\n \r\n\r\nPaste in your MBID into the form and click the “Add” button to the right. You will get a “Album added” message that confirms that the album has been added to our database.\r\n\r\nAfter the album has been added, you will find it in the list that appears after you clicked the “Upload” button. That wasn’t very hard, was it? :-)\r\n\r\n\r\nQUESTIONS & ANSWERS\r\n\r\nQ) I followed the tutorial to the point, but the album I want to add isn’t listed at MusicBrainz.org. How can I add it to fanart.tv then?\r\nA) No need to worry! If the album you want to add isn’t at MusicBrainz.org, you need to create yourself an account at MusicBrainz. This way you can add releases, artists etc. to their database. When you are logged in at their site, choose “Editing” and “Add release group” from the menu. For more help on adding release groups, please read https://musicbrainz.org/doc/Release_Group.\r\n\r\nQ) The site tells me that the album already exists. What to do?\r\nA) Well, the problem is exactly that! The album has already been added to the database. Please double check the releases on the artist you are trying to add a release too. You have probably overseen it in the list :-)\r\n\r\nQ) I’m trying to add a release, but the site returns a “Not a valid release group id”. What am I doing wrong?\r\nA) This means that you have copied the wrong MBID from MusicBrainz. Make sure that you have copied the release group ID, and not just a single MBID from an album. There is a difference. A remix album doesn’t have a release group ID. For example, the album “Unapologetic” from Rihanna have different releases. One normal release, one deluxe edition and a remix version. All those are added in one release group called “Unapologetic”. You want the MBID for the release group, and not the actual album itself.\r\n\r\nQ) I still have problems and need help… Can anyone help me?\r\nA) Sure! All of the staff will be happy to help you. If you still need help, please visit our forums to ask your question or get quicker help by visiting our IRC channel #fanart.tv on the network Rizon (irc.rizon.net).